Congress, overriding the concerns of those disturbed by human rights violations, recently passed legislation that facilitates the expansion of trade between the U.S. and China. China is a huge and undeveloped market for American economic interests, which have prevailed over other concerns–not exactly a new pattern in American history. But the U.S. is neither the only nor the least-principled economic opportunist to have eyed China with greed. A century and a half ago, the British, in grand imperialist fashion, waged and won the Opium Wars against the Chinese, who had tried to prohibit the British from selling opium in China; China was already experiencing widespread addiction from illegally imported opium brought in by the British. (The British, of course, used their profits from the drug trade to buy Chinese tea for export.) The treaties that followed from British victory opened up the major ports to traders and commerce and the resulting influx of Europeans had deeply unsettling influences as China emerged from eastern insularity onto the world stage. A century later, the Cultural Revolution once again threw all of China into turmoil, precipitating profound social, economic, and political transformations. Between the Thunder and the Rain is a remarkable exhibition, drawn from a private collection, of some 120 Chinese paintings in traditonal styles created during this historical period of accelerating change. While these works rarely display in a direct way the turbulent times in which the artists worked, variations in technique and expression did emerge in this period of cultural change, even within the context of traditional methodologies. It is impossible to view this exhibit without having sameness resolve into astounding diversity. And, aside form the scholarly and historical contexts, Between the Thunder and the Rain offers a sensually rich visual experience. Arranged in three chronological groupings, the exhibit includes hanging scrolls, handscrolls, horizontal scrolls, fans, and albums. Calligraphy is an integral part of most of these paintings, and, indeed, there are examples in which calligraphy is the exclusive content. Westerners can only wonder at a centuries-old tradition of rock painting as a specialty; painter Zhou Tang took rocks as his exclusive subject matter in the latter part of his life. Rock, 1874, takes this most inert of subjects and injects it with energy that leaps from the scroll, energy generated by the twisting, angular form and the freely applied brush strokes. The dramatic, bold shape, standing alone without background, is at once an abstraction and a paradox in its contrast of subject and technique. Two landscapes by Chen Chongguang offer strong contrasts in technique. In a river landscape of exquisite delicacy, the water is suggested by the simplest of rippling lines. A small bridge and two figures in the foreground are achieved with virtuosic economy. The slightest touch of color defines some blossoms on a tree and the robe of the leading figure. The serpentine composition of trees and rocks leads the eye upward to the far shore with a house on a hill, and onwards yet further, fading into a merely suggested distance. Another landscape by Chen is in a completely different style, filling the scroll with dense pattern, stronger color, and a blunt brush stroke. A path and then a stream carry the eye once again on a serpentine line from the figures in the foreground, past a strongly defined building to a bridge upstream on which two figures are seated, and on to the looming mountain in the background. A profusion of blossomsis suggested by differing repeated patterns of brushstrokes. 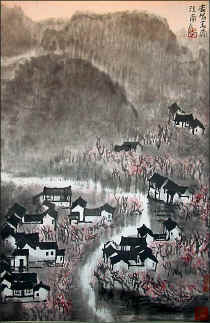 There are plum blossom paintings (another long tradition), bird paintings, horses, portraits. Paintings from the later periods experiment, play with the traditions, but never abandon them. Fang Yi creates a monochromatic, goggle-eyed dragon, emerging from vaporous clouds, breathingout a stream of water that becomes the waves of the sea. Wang Zhen in "Cat with Rock and Banana Tree" and "Lichee and Rock" combines powerful brushstrokes with wash as he explores these symbols that have their own resonance in Chinese culture. A handful of the later works even delve into direct social commentary. What might have started out to the unaccustomed eye as sameness is quickly differentiated in an extraordinary range of subject matter, technique, and style, all the more stimulating for its varied connections to a long and distinguished tradition and the complexity of the history from which it emerges.